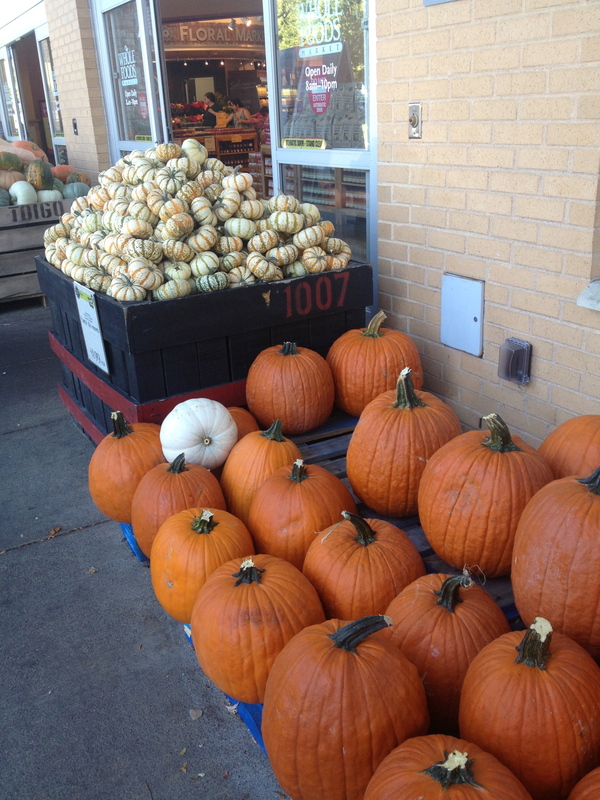 Squash season has arrived. That doesn’t just mean it’s time for a Pumpkin Spice Latte. 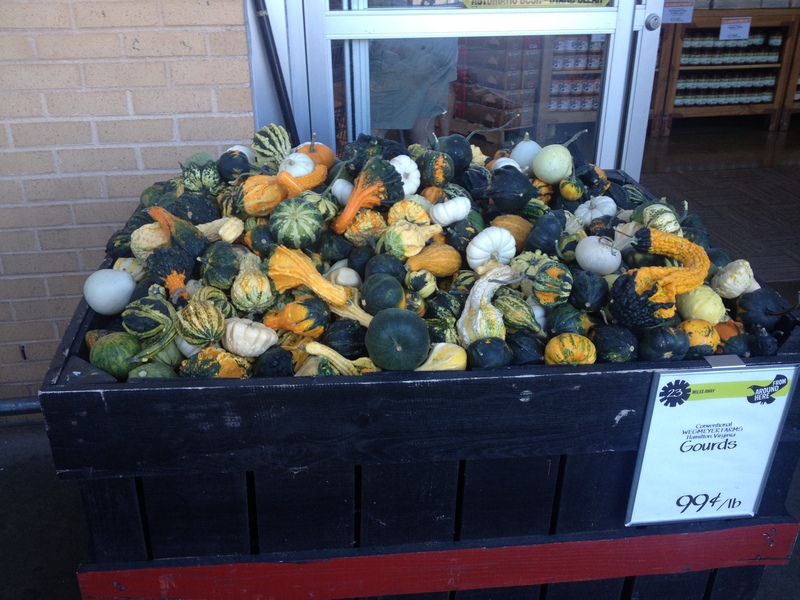 It means that, here in America, the displays of every supermarket and decorations at the front of every store – as well as the pastry cases in all the cafés – are suddenly, from one day to the next, filled with rows upon rows, mountains upon mountains of all things having to do with squash. 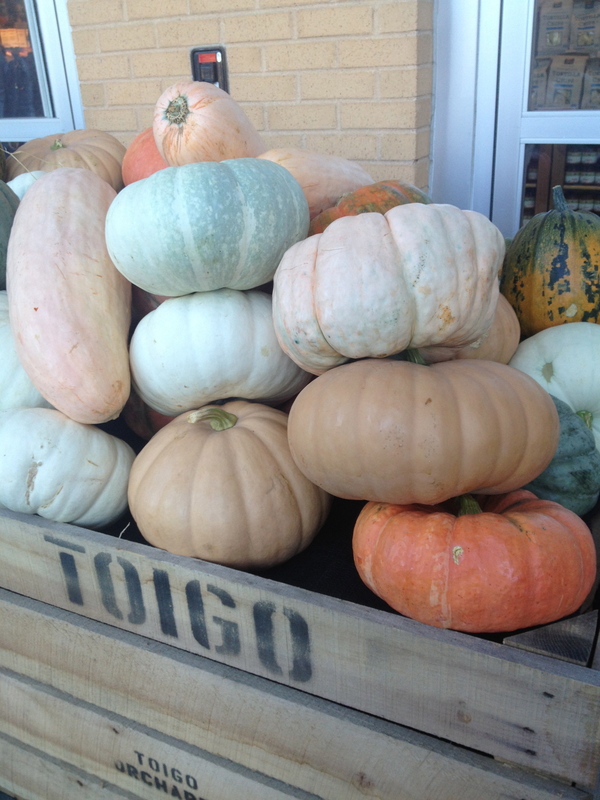 Whole Foods Market presents arriving shoppers with a veritable mountain of gourds. Living in Europe, this amazing variety of squash was one of the things that I missed most right around this time of year, because it never felt like the arrival of fall (sorry, my British friends, autumn) got the fanfare it deserved without these bright orange and green displays, evoking the color of the changing leaves on the trees. 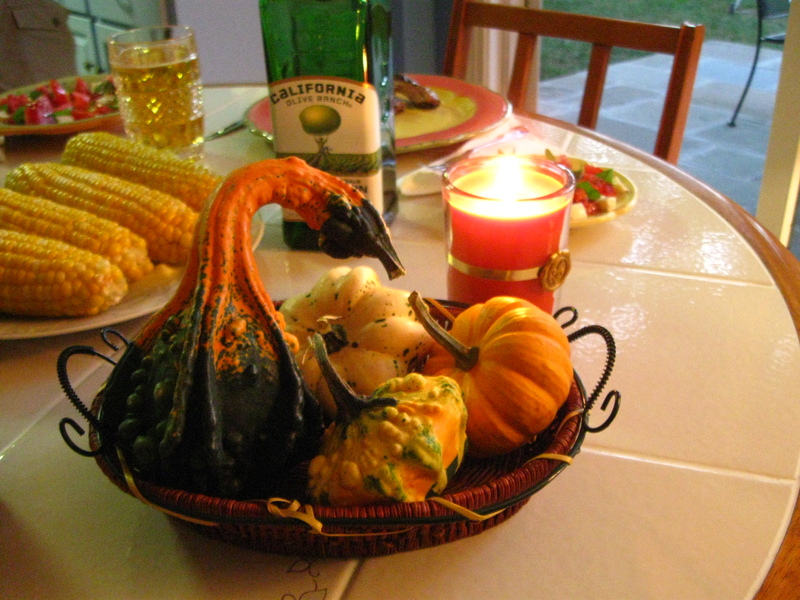 My autumn table center piece, four fall gourds, complete with matching candle. How many times I wished I could roast a nice butternut squash for my Italian friends! Alas, living in Italy, such a thing was not to be. Acorn squash, spaghetti squash and all the other lovely varieties that we take for granted (butternut is my personal favorite), in Italy no one has ever heard of, unless they’ve spent some time over here in the States. A pumpkin spice latte cupcake my sister bought for me. She knows me well. 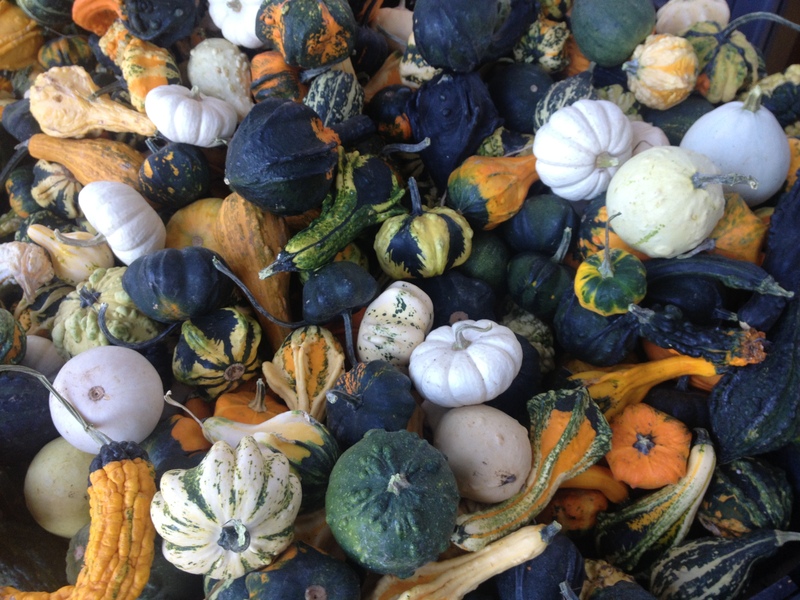 The other thing that shocks most Italians is the use of pumpkin or zucchini in anything sweet. Mention zucchini or pumpkin bread or muffins, pumpkin cookies, cakes or pie and they look at you as though you have gone insane. In Italian cuisine, squash stays firmly ensconced in the land of the savory. As with most Italian food, the recipes are wonderful, as those who have tried ravioli di zucca can attest. Put it in front of them, however, and even Italians will go ga-ga over a good pumpkin muffin (as my former roommates in Rome might confirm). 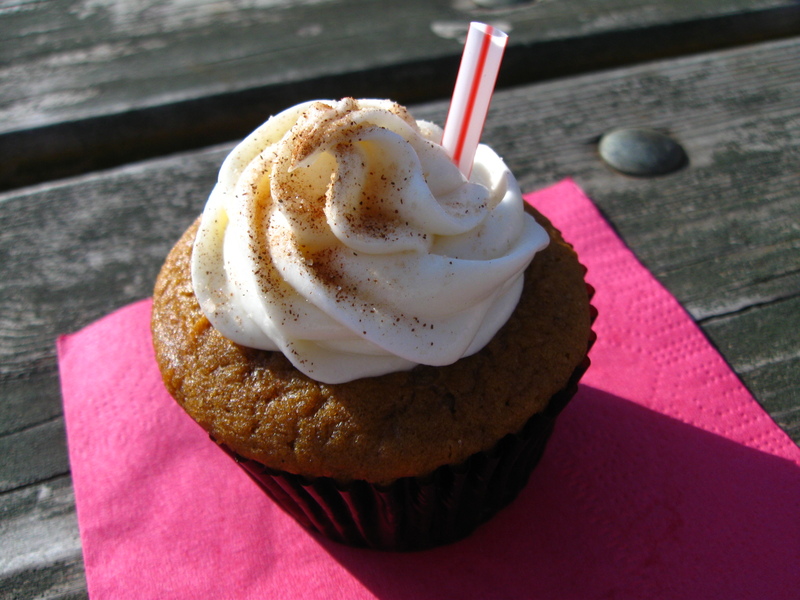 On the sweeter side, the pumpkin spice latte cupcake you see in the photo here is from Sweet Therapy bakery (their tag line: baked intervention – another example of American advertising with a sense of humor). 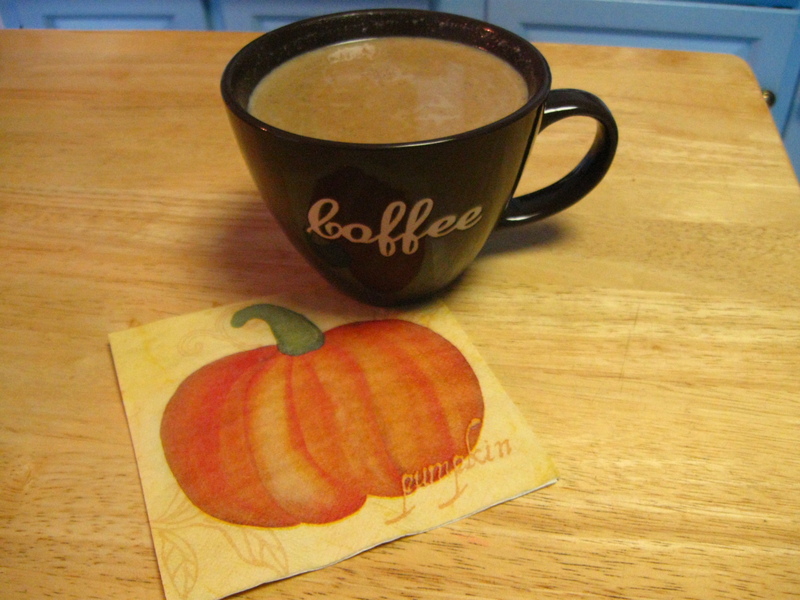 Another thing we like to do in America is drink our pumpkin-related beverages. We break them out the first time we wake up to find a chill in the air. I’m not talking just about the by-now-famous Pumpkin Spice Latte, which, thanks to Starbucks, is fairly well known even abroad. I’m talking about the kind you have to be legal age to drink. Now, my Italian friends might cite Rabarbaro Zucca (a rhubarb-squash digestif) as an example of the fact that they do this too. It’s true. But one bitter after-dinner concoction cannot compete with entire shelves in supermarkets stocked overnight with dozens of varieties of pumpkin ales and ciders. There isn’t a self-respecting brewery in the country that can get away with not making some pumpkin offering come fall. 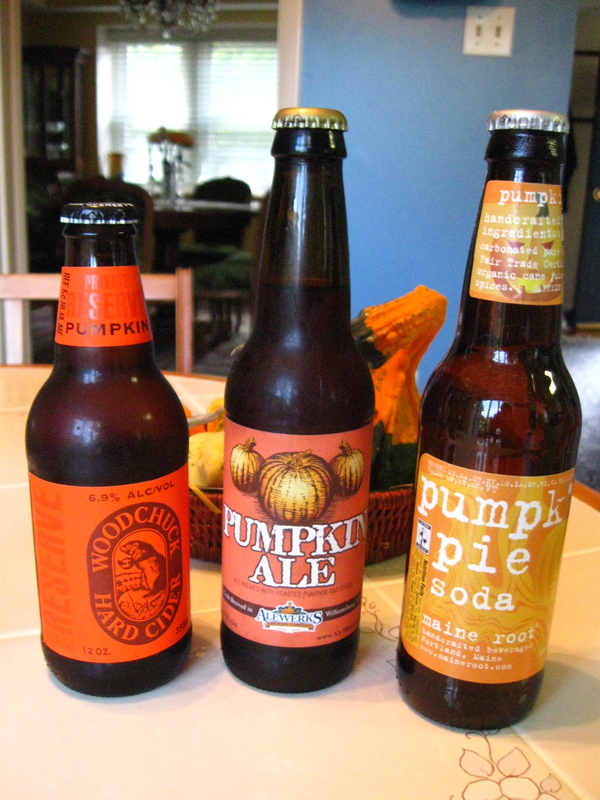 Pumpkin cider, pumpkin ale and – for you teetotalers out there – a pumpkin pie soda. These are just a few of the pumpkin-themed beverages available in America this time of year, and it just wouldn’t feel like autumn without them. Now, we started out this post with a mention of Pumpkin Spice Latte (for my Italian friends out there, latte, in American café parlance, does not mean plain milk, but caffè latte. We abbreviate. I know, it’s confusing.). We have continued to mention it throughout the post, so I think that you foreigners out there deserve an explanation. Starbucks made the pumpkin-spice flavored coffee beverage famous, but now even McDonalds has one on sale (I have not dared to try it, and I probably never will). You non-Americans out there might be confused by the term “pumpkin spice” . Well, what we mean is generally not that that these beverages are somehow made from actual pumpkin, but that they are flavored with all of the same spices that go into a pumpkin pie: cinnamon (most importantly) followed by nutmeg, ginger and clove (that’s my grandma’s famous blend, although I’m sure different families have different recipes). Spices in the pot, ready to be whisked. 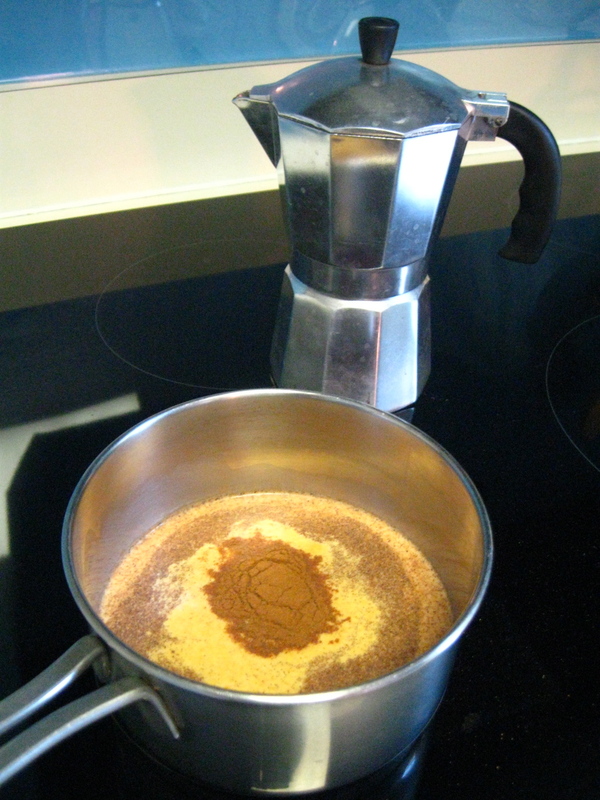 Prepare your espresso coffee. When it is ready, measure out your milk and pour it into a small pot. Add spices while milk is heating and whisk until they are no longer clumped together. Heat until milk is steaming but do not boil. Pour the mixture into your mug and add the coffee. Sweeten to taste (I find honey, agave or brown sugar all complement the spices nicely). So, wherever you are, here’s wishing you a fragrant and warming cup of pumpkin spice and a wonderful beginning to your autumn. 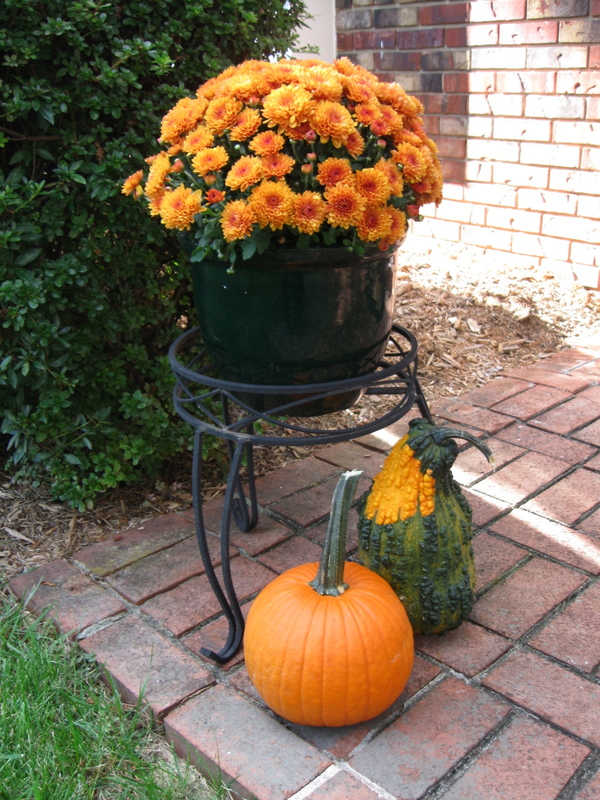 Even our front door knows fall is here. See you all next time! This entry was posted in Glorious Food! and tagged Butternut squash, Italy, Latte, pumpkin spice, pumpkin spice cupcake, Pumpkin Spice Latte, squash, Starbuck, Whole Foods Market. Bookmark the permalink. Mi piace moltissimo questo post! Tutto mi piace. Devo venirci! Traduco come posso( sorry for my English 😀 ): I love this post! Everything I like. I’ll come there!I have to.